A very important characteristic of the titanium is that it can be treated to produce other colors such as purple, black and blue than its own grayish tint.The black titanium is nowadays a very popular alternative to traditional precious metals and is a very durable metal compared with silver and gold. And I want to begin first with this stunning black titanium engagement ring. So, if you want to impress someone this is definitely the one. What is really amazing is this next engagement ring; an 18k gold with three diamonds along each side and a gorgeous ¾ carat trillion white sapphire with rounded sides. I know that this ring is a little expensive but you have to recognize that is a spectacular ring. And for those who love the precious gemstones, especially the emeralds, this engagement ring that you can see bellow could be the one you were looking for. The combination between this precious emerald gemstone and the titanium turn this ring into something unique, modern and elegant. Another great combination is the next one, black titanium and 14 k gold engraved wedding band; it’s something different from the classic engagement band and very elegant too. Boccia Titanium offers an extensive collection of jewelry made of pure titanium with original and creative designs. The combination between gold and diamonds, makes these rings peerless and something you’ll want to have for your wedding day. 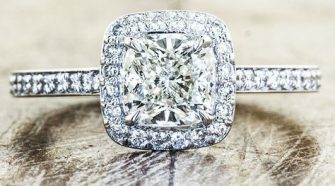 Keep in mind that the engagement rings are not only a brilliant jewelry, also represents the unconditional love; is regarded as a symbol of commitment and unity. This is why it is necessary to choose the correct ring. 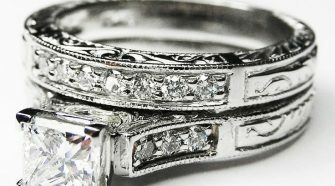 I really hope you liked these titanium engagement rings and you will be able to choose without too many headaches.